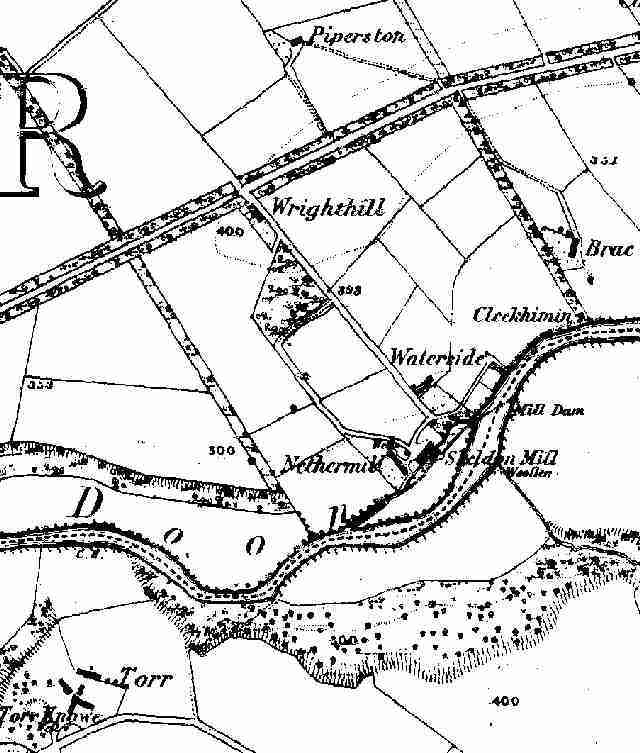 Below: A section of the 1856 OS map showing Skeldon Mill. James McCardle, 16 Nov 04: Family history centred on great-grandparents living in SKELDON MILLS COTTAGES near Dalrymple, Ayrshire during the years from about 1879 to 1906 - Knox Family - James Knox buried in Dalrymple churchyard Grave No.83. Interest in any history of Skeldon Mills (Woollen Mills) on banks of River Doon; now place only marked by plaque - is now caravan, camping site. old pictures, drawings or illustrations, etc. or previous research history of wool weaving etc. in Ayrshire which may contain links. 3) Woollen manufacture was a minor industry in the west of Scotland. In The Development of the West of Scotland 1750-1960, London 1975, Anthony Slaven devotes a chapter to 'The industrial base: the triumph of textiles', but the words 'wool' and 'woollen' do not appear in the index. The important textiles were linen and cotton. 4) The following is by James Pearson Wilson, from the compilation of his articles edited by Agnes M. Wilson and Susan W. Smith, and published under the title The Last Miller: The Cornmills of Ayrshire by the AANHS in 2000.